click here to reserve a room or find a vacation package today with INTERCOT's Official Travel Partner! 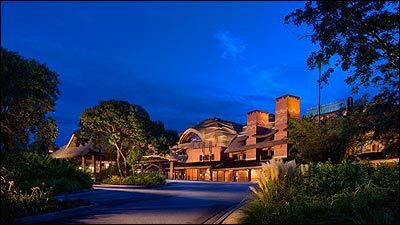 Animal Kingdom Lodge is adjacent to Disney's Animal Kingdom and opened in 2001. 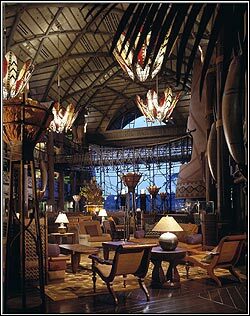 This resort resembles a small African lodge, built on a watering hole, near an extinct volcano. The watering hole starts outside the resort, runs inside, under a bridge, through one of the restaurants, and back out the resort. 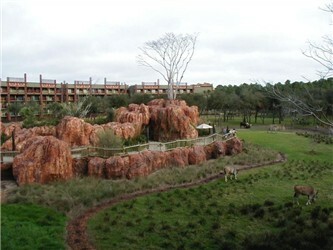 The savannah which has no connection to the Animal Kingdom wildlife area, has various forms of wildlife in the 3/4 of the resort that it covers. You can expect to sometimes have animals as close as 30 feet from your windows. As you drive up to the resort, all you see is a small gathering of thatched roof huts. 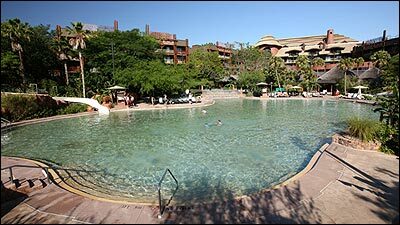 The incredible size of the resort is hidden from the front. It will be like driving up to a small Safari Village. Nightly by the large glass wall, a Cast Member from Africa tells stories. "Safari Guides" are also on hand to educate guests on the animals. The lobby has a 5 story fireplace. Guests enter the Lodge on the 3rd floor. There is a huge picture window which looks out upon 33 acres of land. From here, you can walk out onto an elevated viewing area, Arusha Rock, and enjoy the roaming animals. Throughout the rest of the lobby, you'll find examples of authentic architecture and designs. Rich wood tones surround the large mud fireplace and natural lighting celebrates dawn and dusk with features that accentuate spectacular sunrises and sunsets. 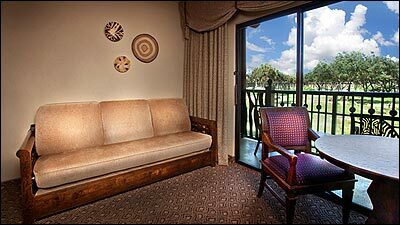 In the hallways, there are alcoves with glass windows providing Savanna overviews. This hotel is uniquely laid out, with all of the 970 rooms in wings attached to the main building. 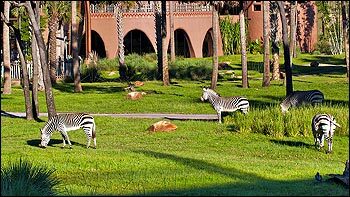 It follows the Kraal African Village design of a horseshoe, giving most rooms a view of the private wildlife reserve. The animal plains extend almost completely around the entire complex, stopping at the backsides of the two front wings. 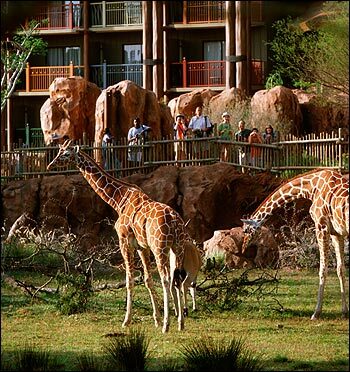 Guests will be able to stand on their balconies and watch animals and birds on the African savanna. Intercot Tips: There is a lodge tour daily. Inquire at the Front Desk for details. Bring your binoculars! 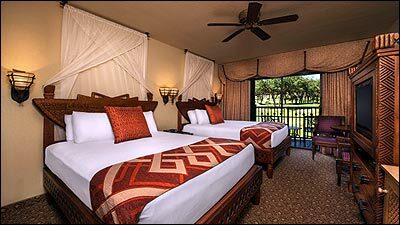 Savannah View Rooms provide night vision goggles to see the animals, but binoculars will allow you to see even more during the day. There are several different types of rooms available, including Club Level rooms and Suites. 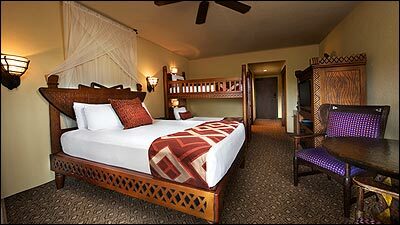 All rooms feature hand crafted dark wood furnishings, sand colored walls, earth toned carpeting, vibrant tapestries and colorful artwork. Bunk bed and King bed rooms are available. Rooms are available with one of three views: Standard, Pool, or Savannah. 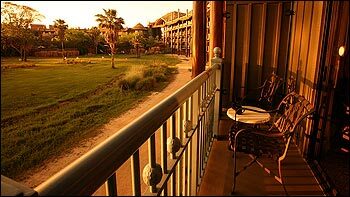 Savannah View rooms may overlook one of several savannahs. All rooms have balconies. Club Level rooms are also available. What can I expect to pay for a room? Rooms range from $308-$696 per night. Club Level Rooms range from $499-724 per night. Suites start around $1,000 per night. Rates fluctuate based on season and are higher on weekends and holidays. Number of beds: Rooms can have 2 Queen beds, 1 Queen with a set of Bunk Beds, King Bed with Daybed, or Handicapped accessible with King Bed and Daybed. Features of Room: Dresser, refrigerator, table with two chairs, large closet with shelves, night stand, TV, telephone, coffee maker, free Wi-Fi, ceiling fan, iron, ironing board, pack and play, in room safe. Some rooms feature an additional dresser. Bathroom: Vanity with dual sinks located outside the bathroom, which features a commode and bathtub. A hairdryer is provided. Occupancy: All rooms except suites have a maximum occupancy of 4 people. 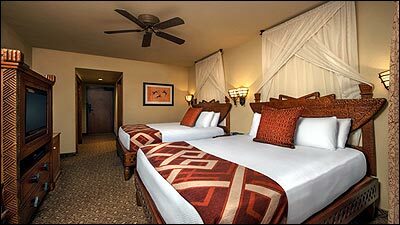 If there are more than 2 adults in a room, there is an additional charge of $25 per adult, per night. Select suites sleep up to 6. Suites: 1 and 2 bedroom suites are located at the end of the Animal Trails. From the outside of the Lodge, they are the rooms found within the rounded parts of the building, with the curved balconies, topped with thatch. They are located on the 2nd, 3rd, 4th, and 5th floors. All suites include Club Level access. Kilamanjaro Club: Club Level rooms are located on floors 5 and 6. The actual lounge and staff are located on the 6th floor. Amenities include pre-arrival planning, private check-in, robes, make-up mirror, in room DVD players (DVDs can be checked out from the lounge), turndown service, and lounge (7am-10pm daily) with continental breakfast, midday snacks, evening beverages, wine and hors d'oeuvres. Club Level rooms have either a Savannah or a pool view. 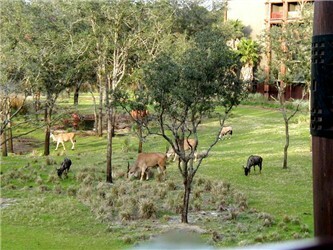 Animal Kingdom Lodge club level guests can partake in the Sunrise Safari Breakfast Adventure. Visit our Club Level page for more details and guest feedback. 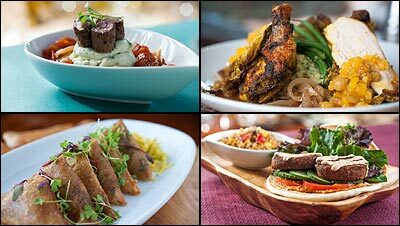 Enjoy the creative offerings of New African cuisine prepared by chefs borrowing from the culture and flavors of Europe, India and Asia. The escaping aroma of freshly baked bread inside wood burning ovens will beckon you. Jiko is a Disney Signature Dining experience. Entree selections include Horseradish-Crusted Salmon, Duck Two Ways, Oak Grilled Beef Tenderloin and Vegetable Cake. Desserts and appetizers also offered. Serves the robust wines of South Africa along with light food items. Buffet restaurant where culinary experts craft salads and roasted meats inside an open kitchen for all to see. Breads and desserts are hand prepared in the bakery under a thatched roof. A kids' corner offers children's favorites and an opportunity to have fun with the chefs. Over 50 African countries from the coast of the Mediterranean to the Indian Ocean influence the cooking. Anticipate the best in African hospitality at this family buffet. Experience African cooking with Indian flavors at this colorful dining room overlooking the savanna. Watch animals roam as you enjoy slow cooked meats, salads, and vegetarian specialties. Fruit, breakfast sandwiches, pastries and baked goods, waffles, salads, sandwiches, pizza, BBQ tofu, hot dogs, burgers, desserts & beverages. Grab and Go items also available. Serves specialty coffees, African wings, wines, and International beer in the evenings. Pool side bar for drinks and snacks. Available each day from 6:30AM-12:00AM. A menu is provided in each room. Swimming: There is a themed pool, Uzima, which has a zero entry. A kid's wading pool and two spas are available. Playground: The Hakuna Mattata playground is located near the pool. Simba's Clubhouse is a supervised childcare club for kids ages 4-12. For more details visit our page on Childcare facilities. 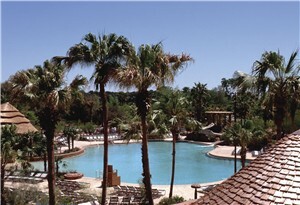 Games: High tech game room, Pumbaa's Arcade, is located adjacent to the pool area. Fitness: Zahanati Fitness Center,located near the pool, is open 24 hours a day and features a selection of cardio and weight lifting equipment. Use of the fitness center is complimentary for resort guests. Non resort guests may use the facility for a daily fee. There are two clay tennis courts available for guests. Paths are also available for walking and jogging. Shopping: Zawadi Marketplace offers Animal Kingdom logo merchandise, Disney character merchandise, toys, souvenirs, snacks, and sundries. Bus: Bus transportation is available to all theme parks, water parks, and Disney Springs. Check in time is after 3:00 PM. Check out time is by 11:00 AM.